Authors: Steve Howell, et al. Last May, we learned that the Kepler Space Telescope could no longer go on finding transiting exoplanets as it had since its launch in 2009 due to the failure of a critical reaction wheel used to accurately point the telescope. Although Kepler could no longer carry out its intended mission, many of its powerful capabilities remain intact. The team called for ideas for a second mission for Kepler, and astronomers enthusiastically submitted their plans, which I summarized in this astrobite from last September. 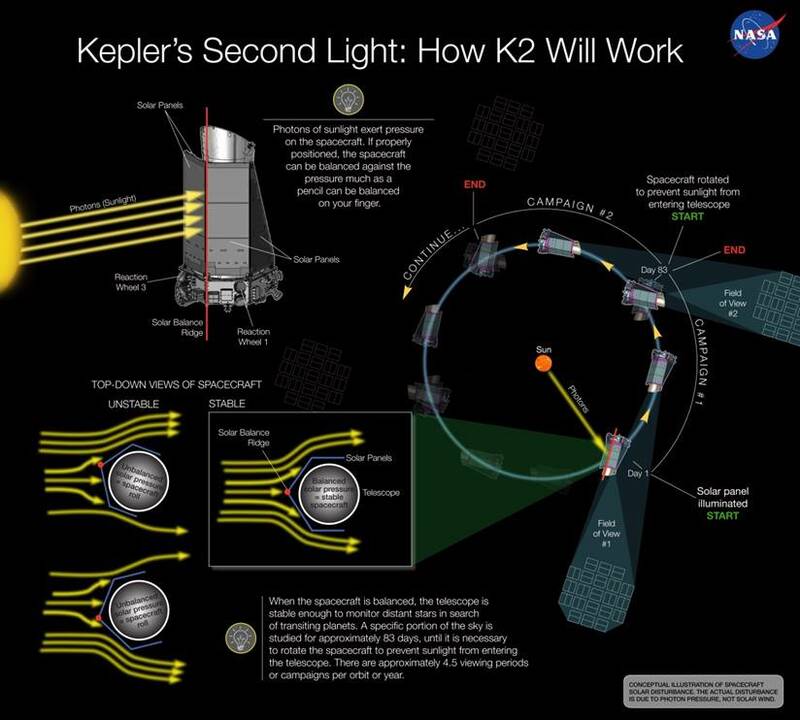 Since then, the team has considered these ideas while formulating a new mission for Kepler called “K2”. K2 was discussed at the AAS meeting in January, which was covered in this astrobite. Now, Steve Howell and collaborators have put on the archive a more detailed description of the K2 mission, which I’ll review in this post. The original Kepler mission observed a single patch of sky, monitoring a pre-selected set of 156,000 stars for the changes in their brightness that indicate the presence of transiting planets. With Kepler’s reduced pointing capability, the light from the stars would drift across the camera over time, smearing out the signal and reducing the sensitivity of the instrument to detect very minute brightness fluctuations. K2 is designed to minimize this problem by pointing only in the ecliptic (the plane defined by Kepler’s orbit around the Sun), so that the photon pressure from the Sun on the spacecraft is balanced. But pointing in the ecliptic means that Kepler can no longer focus on a single patch of sky, because at some point in its orbit, Kepler would be pointed towards the Sun (and sunlight would get into the telescope). So for the K2 mission, Kepler will point to a new field of view every 83 days. These 83 day long periods of time, and their corresponding fields of view, are called “campaigns”. The way that Kepler will reorient to a new field of view for each campaign is shown in Figure 1, and the locations of these fields are shown in Figure 2. While the campaign fields have been chosen, the specific targets within each field to be monitored have not. K2 is a “community-driven” observatory, so targets will be selected from proposals submitted by anyone in the scientific community. The team expects to observe between 10,000 and 20,000 targets in each campaign. Figure 1. A diagram of how Kepler will reorient to a new field of view for each campaign. Also shown is how the spacecraft will be balanced against radiation pressure by staying pointed within the ecliptic plane. Compared to the original mission, K2’s ability to detect transiting planets is reduced in two ways. First, its photometric precision–the ability to detect minute changes in a stars brightness–is about 4 times worse (although it would have been even worse if the telescope where not confined to point in the ecliptic). Second, the time baseline over which each target can be monitored is drastically shortened due the necessity of using multiple campaigns. K2 will not be able to detect new planets in the habitable zone around Sun-like stars because the planet’s orbital period would be about one year, compared to an 83 day campaign. M stars will make great targets for K2’s planet search because the habitable zones are much closer to these stars (so habitable planets will have shorter orbital periods), and the stars are smaller, so small planets can still make a detectable dimming effect when transiting, even with K2’s reduced sensitivity. Despite these limitations, K2’s large field of view, its still impressive photometric precision, and its ability to continuously monitor targets with high cadence make it superior to ground based programs for detecting transiting planets. The target stars of the original mission were generally far away, and thus fairly faint, but K2 will likely target much closer stars. The planets that will be found by K2 around these nearby stars will thus be much easier to characterize with detailed follow up observations using other telescopes. K2 will also be able to target stellar clusters, which have not yet been thoroughly studied for transiting planets. Young planetary systems could also be studied by K2, from which we could constrain our planet formation and migration theories. In addition to looking for more transiting planets, K2 can study anything that varies in brightness. This includes the target stars themselves, as well as AGN, supernovae, and gravitational microlensing signals. Of course, the exact science that K2 will do depends on the targets proposed by the community! While the K2 program does not have official funding support yet from NASA, campaign 0 has recently begun. You can follow the latest on the K2 mission here and here. And, of course, we’ll keep you updated with important developments on astrobites! Figure 2. The locations in the sky of the fields of view along the ecliptic for the ten proposed K2 campaigns. These span a range of galactic coordinates. Note that field 9 appears out of place because the telescope will be pointed “forward” during this campaign (it will usually point backward relative to its orbital direction).